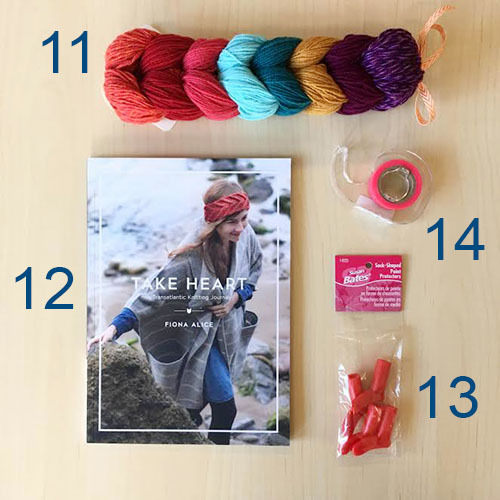 Gift Guide for Knitters and Fiber Lovers! So you have a beloved fiber lover, and you're stuck on finding them a gift. Let us help you! 2. A sweet I Heart Stitch Art embroidery kit! 4. Pom pom makers! They come in assorted sizes and are a perfect stocking stuffer. 9. Embroidered doll kits, complete with wool stuffing! 10. A JessaLu project bag. Comes in assorted fabrics and every knitter and crocheter loves a project bag! 11. Lux Adorna Fun Sized Sport Bundles - adorable bundles of cashmere, with a cowl pattern included. A lovely little luxury! 18. A Circle of Stitches stitch gauge! A great stocking stuffer. 19. Heart-eyed Sheep Enamel Pin, to adorn their project bag! 23. Woollelujah! A tote bag for all their yarn, because who doesn't love a tote bag? 24. High Fiber Diet tote bag, because see above. Still can't decide? Get your loved one a gift card! PS. How about this super cool Yarn Pyramid art print?